This photo, taken by someone at Skull Creek Dockside Restaurant, is so fabulous we just had to share it! Not only is the photo great, so is their food, which we can attest to! 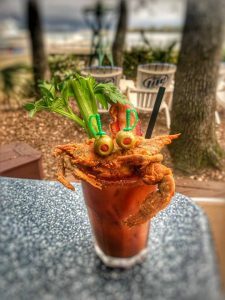 One of my favorites is the chicken livers with pimento cheese grits….. Join them for happy hour, brunch, lunch, dinner….all of us at Southern Lifestyle Properties are hoping to get over there today so we can partake in the Bloody Mary Soft Shell Crab!! Click on the restaurant name for their menu and info!